This 65 Plymouth altered wheelbase was built in 2012 by Joe Black as a tribute to our first funny car known at the time as "The American". Joe was taken ill in early 2013 and only displayed the car twice before he passed away in fall of 2013. This picture was taken at Pocono Drag Lodge. Joe was in attendance when it was brought there by the new owner, Mr. Ray Brawn. 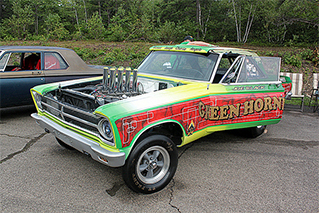 The other pics are of the Green Hornet Camaro of 1968 and the Green Hornet Firebird of 1969. 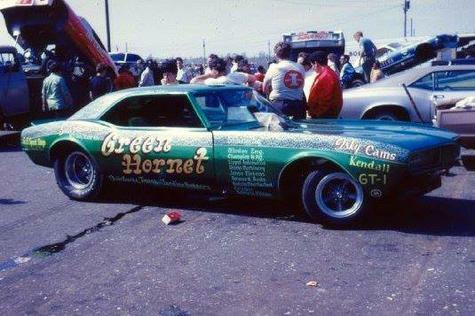 The last hornet was the Mustang run by Joe and Rollie Linblad in 1970. That car ended Joe's racing days in a fiery explosion. 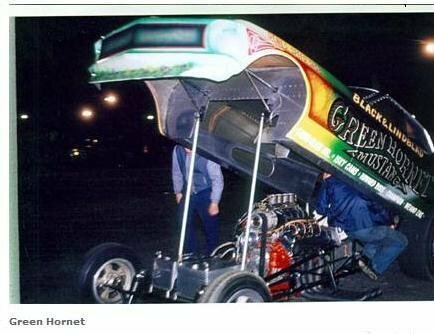 I was well aware of the Green Hornet Firebird...I didn't know about the others....thanks for sharing the info and pics. BIG BIG BIG THUMBS UP !! !